No Watchtower or Workbook on my Today screen? If you are trying to get publications for 2019, please make sure you have read this important announcement. The problem: Equipd used to show the Watchtower Study and and CLAM Workbook schedule under the Daily Text - but it is not any more? But I checked WOL and can see the information is on WOL? It really comes down to when the brothers added this content to the Daily Text on WOL. Basically what happens is that the Daily Text is available for the full year. But the extra details on the Today screen, such as the Watchtower study material and mid-week meeting schedule, are added progressively throughout the year. Which makes sense as the magazines and workbooks are also released progressively throughout the year. 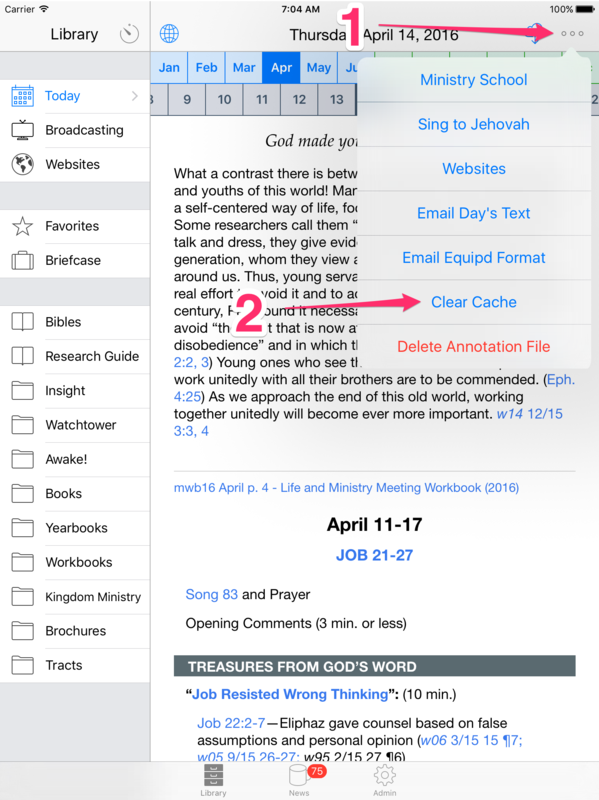 So if you cached the Daily Text files on a certain date, and then a few days/weeks later the brothers go and add the next lot of Watchtower Study articles or workbooks, then your cached files will not include this information. The fix to this is fairly easy. In Equipd just clear the cached Daily Text files, and cache them again. Please note that the above comments are all based on the assumption that the Watchtower and Workbook for the current month etc are actually available on WOL. For example in order to see the March Workbook programme under the Daily Text, then the March Workbook actually needs to be on WOL first. So that is also something to check - you cannot just assume that the brothers have always added the latest mags or workbooks on WOL. If you had annotated (highlighted) any content in the current Daily Text before you followed the above steps, you will likely need to delete your annotation file as well before you see the refreshed content. Same steps as above but choose the red "Delete Annotation File".